Harris began this project in 2009, based on his own personal relationship to Harlem, collecting over 3,000 interviews and stories where the photograph is the central launchpad for personal narrative. His personal narrative began with the discovery of his grandfather’s archives ~ photographs from the Bethel AME Church (also known as Mother Bethel) located at Lenox Avenue and 132nd Street, and taken during the 1960s along with footage of Bethel and Harlem in the 1940s. 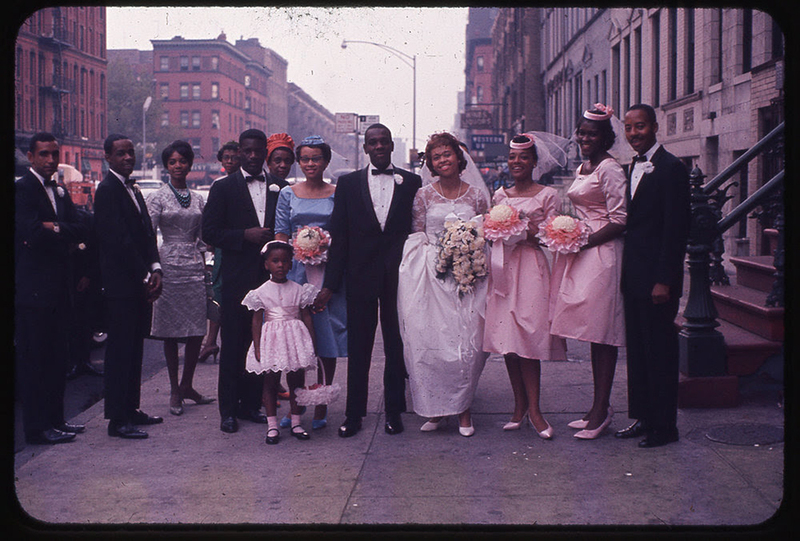 These are rare glimpses left by his grandfather, an amateur photographer, of old Harlem. Harris’s part in this collaboration with students, is a remix of his own work with the work of his grandfather, Albert S. Johnson, Jr., as well as the addition of Harris’s 1987 documentation of James Baldwin’s funeral at the Cathedral of St. John the Divine ~ which will be exhibited for the first time in the Hunter East Harlem Gallery window. Taking Harris’ lead, the students have conceived works inspired by the family photo album, practices of archiving and the local community, Harlem and East Harlem, in which they live. They have not only remixed, but expanded the archive within the gallery space, using methodologies that Harris has been pioneering for over 25 years. Here, they explore familial artifacts, the relationship between photography and memory, and stories that are deeply rooted in their local community ~ materials and documentation taken of locals with their archives during a week-long DDFR roadshow at Harlem Stage in 2011. Together, Harris and the students create a network of sites with cultural, political, and spiritual significance, that visitors are invited to expand upon. It is a celebration on the theme of collective memory, and a template for visitors to use in their own communities and in their own lives, with photographs and artifacts. Participating Hunter College IMA/MFA student-artists include Chris J. Gauthier, Patri González Ramírez, Cynthia Groya, Janis Mahnure, Melissa Montero, Allie Shyer, and Jacqueline Wade. Opening Reception, Thursday, August 30 from 6:00-9:00pm at Hunter East Harlem Gallery, 2180 Third Avenue, enter on 119th Street. The interactive exhibition, Thomas Allen Harris: Mother, Bethel, Harlem, USA will be on view to September 29, 2018. In keeping with this theme, walk over to the East Harlem Art Park, one block away,to view the current installation, Present Histories: An East Harlem Photo Album by artist Kathleen Granados, installed through the efforts of Public Art Initiative/Marcus Garvey Park Alliance, Friends of Art Park Alliance, and NYC Parks.